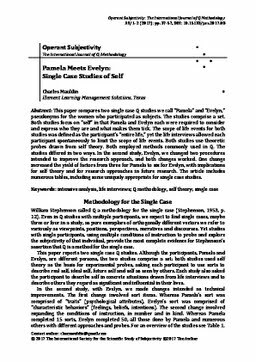 This paper compares two single case Q studies we call “Pamela” and “Evelyn,” pseudonyms for the women who participated as subjects. The studies comprise a set. Both studies focus on “self” in that Pamela and Evelyn each were required to consider and express who they are and what makes them tick. The scope of life events for both studies was defined as the participant’s “entire life,” yet the life interviews allowed each participant spontaneously to limit the scope of life events. Both studies use theoretic probes drawn from self theory. Both employed methods commonly used in Q. The studies differed in two ways. In the second study, Evelyn, we changed two procedures intended to improve the research approach, and both changes worked. One change increased the yield of factors from three for Pamela to six for Evelyn, with implications for self theory and for research approaches in future research. The article includes numerous tables, including some uniquely appropriate for single case studies.